The Town of Souris was incorporated in 1910. The long history of the Town can be seen in the many well-preserved historical buildings. Souris hosts an important ferry link to Quebec’s Îles de la Madeleine, giving it a prime opportunity to attract visitors. The economy of the area is dominated by the seasonal industries of fishing, agriculture and tourism. There are also several industrial businesses and a good retail sector. The town is home to banks, pharmacies, cafés, artists, restaurants, gas stations, a grocery store and other independent businesses, acting as a service centre for the communities on the eastern tip of PEI. Souris has two area schools serving grades K-12. Souris Regional School teaches students from grade K-12. École La Belle Cloche, the French school located in nearby Fortune Bridge, also teaches students from grades K-12. The Town had a very outdated website and used, to varying degrees, Facebook and Twitter. The Town of Souris maintains a responsibility to provide residents and businesses with information on the governance of the municipality, safety notices and town projects and initiatives. It also wished to provide a business listing, community events listing and listings on facilities, services and recreation. The Town also wished to promote local tourism and showcase amenities for new residents and new businesses. 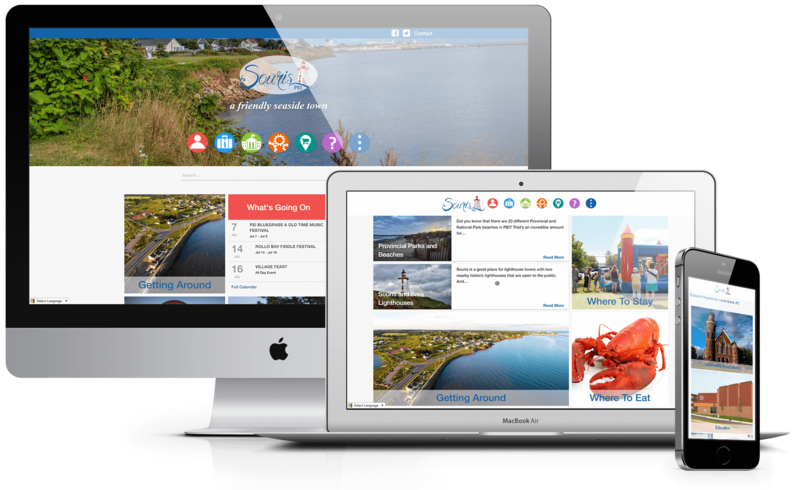 The new site for the Town of Souris is user-friendly for all device-types, thus hoping to motivate involvement and increased engagement in the community.